Once upon a time there was a hare who, boasting how he could run faster than anyone else, was forever teasing tortoise for its slowness. Then one day, the irate tortoise answered back: "Who do you think you are? There's no denying you're swift, but even you can be beaten!" The hare squealed with laughter. The hare woke with a start from a fitful sleep and gazed round, looking for the tortoise. But the creature was only a short distance away, having barely covered a third of the course. Breathing a sigh of relief, the hare decided he might as well have breakfast too, and off he went to munch some cabbages he had noticed in a nearby field. But the heavy meal and the hot sun made his eyelids droop. With a careless glance at the tortoise, now halfway along the course, he decided to have another snooze before flashing past the winning post. And smiling at the thought of the look on the tortoise's face when it saw the hare speed by, he fell fast asleep and was soon snoring happily. The sun started to sink, below the horizon, and the tortoise, who had been plodding towards the winning post since morning, was scarcely a yard from the finish. At that very point, the hare woke with a jolt. He could see the tortoise a speck in the distance and away he dashed. He leapt and bounded at a great rate, his tongue lolling, and gasping for breath. Just a little more and he'd be first at the finish. 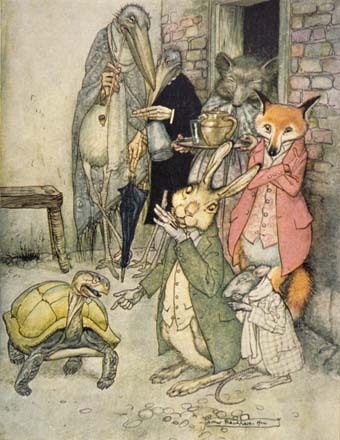 But the hare's last leap was just too late, for the tortoise had beaten him to the winning post. Poor hare! Tired and in disgrace, he slumped down beside the tortoise who was silently smiling at him. "Slowly does it every time!" he said.